Sauté the onion and the garlic in the olive oil in a skillet over medium-high heat. Cook to a pale gold color over high heat, and then add the tomatoes, seasoning to taste. Simmer 15-20 minutes over medium heat. 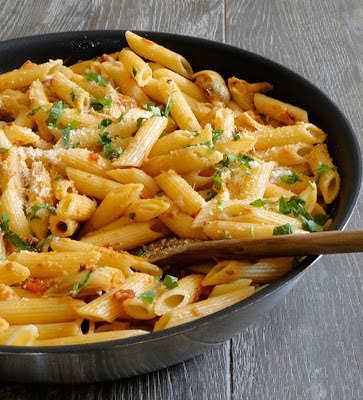 Cook the penne rigate until al dente according to package directions in boiling, salted water. Drain and add to the artichoke sauce. Sprinkle with chopped parsley and grated Parmesan.